About half a year ago I published a post where I tried to explain the usage of 5 different tenses. About 71,000 people have viewed this post but several complained that there was not enough practice. That is why I have decided to reintroduce this topic and add three more quizzes to practise the five tenses. So here we go! Study the following mind map. 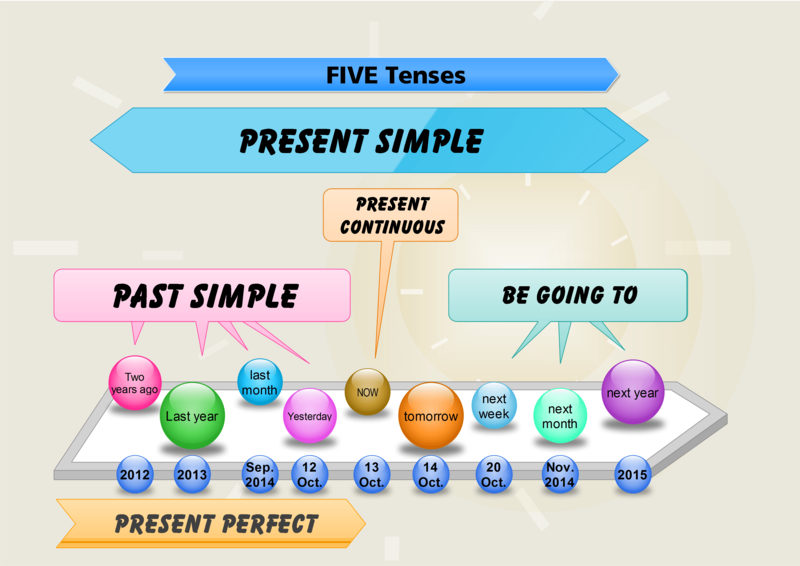 There I try to explain the usage of the following tenses: Present simple, present perfect simple, present continuous, be going to and past simple. And if you think you understand the grammar, it is time to try the quiz. You can choose either the print version of the quiz or the digital version of the quiz. You can download the word document here and you can edit it in any way you like. The key is included. If you prefer the interactive version of the same quiz, you can find it down here. If you would like to do more practice, you can go to British Council site and try several more exercises there. How can I check the mistakes? I am afraid, you can´t at the moment. I have to change the setting of the quiz. Thank you for contacting me.